Emiya Shirou is a highschool boy who lives in Fuyuki City. His parents died in a fire when he was young, after that he was adopted by an old man who refer himself as a sorcerer, but he died too. What Shirou doesn't know, is that the underground of Fuyuki City is the place of a great war. When the time is right, sorcerers from near and far gather with their Servants - the summoned spirits of heroes so mighty they exist outside of time - and fight a war for possession of the Holy Grail, a relic said to grant its owner a wish. 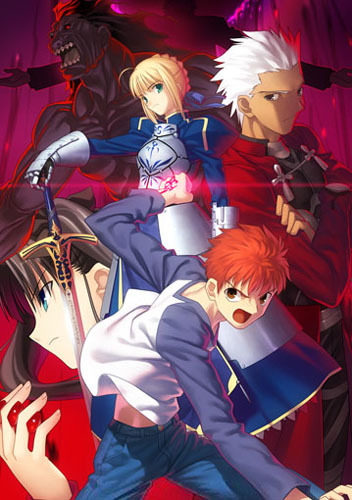 The true names of the Servants reveal their weaknesses, and so they are usually referred to by a classification of type instead; Saber, Archer, Rider, Berserker,Lancer, Caster, and Assassin. One day, Shirou saw a fight between two servants, Archer and Lancer. To preserve the secrecy of the war, Lancer mortally wounds him; but a girl who up until now seemed a normal classmate of his,Toosaka Rin, saves his life using a magical pendant. On his way home, Lancer attacked him again. Just before he's about to die for good, the servant Saber appears before him, greeting him with the words "Are you my master?"